The book represents the first issue of the ACT-Field School Project Reports and Memoirs series, dedicated to the activities of the Italian Archaeological Mission in the Swat Valley, Pakistan. According to the guidelines of the whole project, the focus are archaeology, sustainable enhancement of the territory and its traditions and job creation (vocational training). 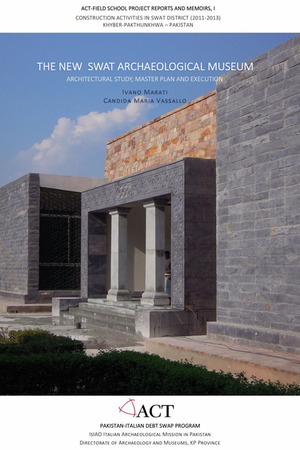 In the volume the authors, Ivano Marati and Candida Maria Vassallo, present the experience of the New Swat Archaeological Museum, from the conception (architectural study and design choices) to the realization (master plan and execution). The text is accompanied by a chapter by M. Ashraf (UET Peshawar) on the health conditions of the old Museums, and a section by Eng. C. Cristilli (AIRES) on the structural calculations for the new structure. The volume is completed by an Introduction by Luca Maria Olivieri on the scientific and social results of the ACT project and by an Appendix edited by Luca Maria Olivieri, an overwiew of the Museum's visual cultural paths. Creative Commons Attribution-NonCommercial-NoDerivatives 3.0 Unported.